Such is the sprawling spread of Melbourne that a journey from the west to Springvale seems like a substantial road trip. 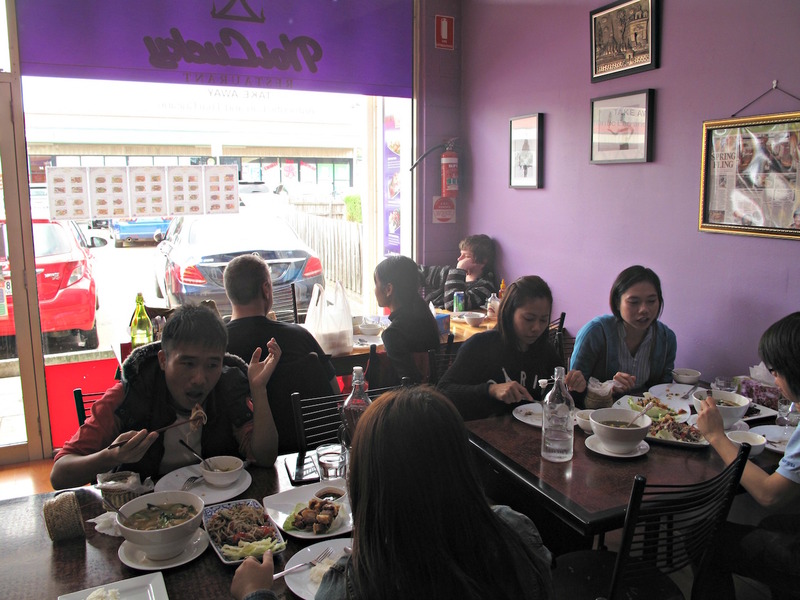 We’re Springvale-bound on Good Friday in the happy knowledge that like its largely Viet contemporaries in Richmond, Footscray, Sunshine and St Albans, the business centre is sure to be rocking despite the public holiday. Upon arrival, we are nevertheless knocked out by the level of rocking. Springvale is jam-packed, gridlock in all directions – much of it seemingly caused by SUV drivers with a penchant for double parking. No matter – we eventually find a park many blocks from our destination and happily walk to our lunch rendezvous. Strangely, this is just our second visit to this intensely foodie neighbourhood – we certainly wish it was closer to home. 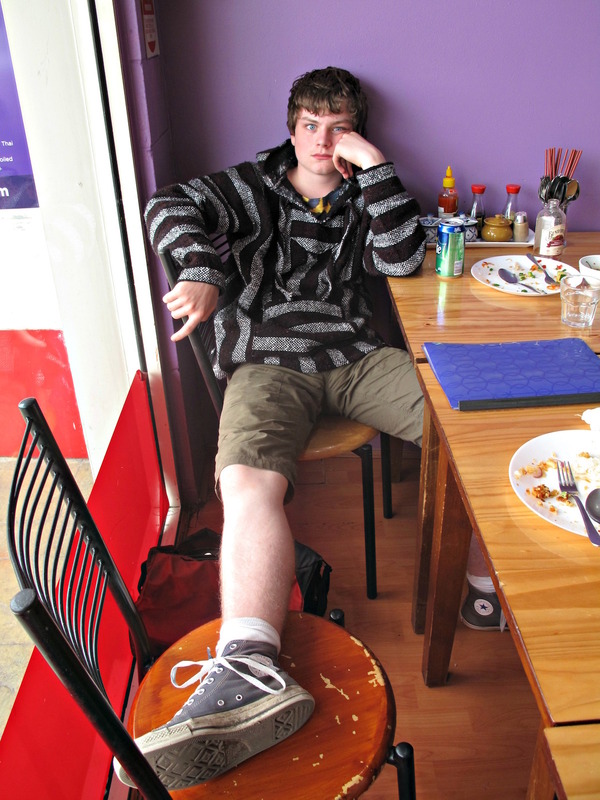 Our aim on that first trip was the same as it is on our second – to eat some really, really fine Thai food. We were flying solo that first time so had an OK lunch but felt we could’ve done better. This time around we have expert assistance in the form of our good mate Nat Stockley (a big fan of Thai food), his wife Jackie (Thai by birth) and their niece Yaya, who arrived from her home in northern Thailand less than 24 hours before to study in Melbourne. We’ve got the A Team on our side this time! And for that we’re grateful. 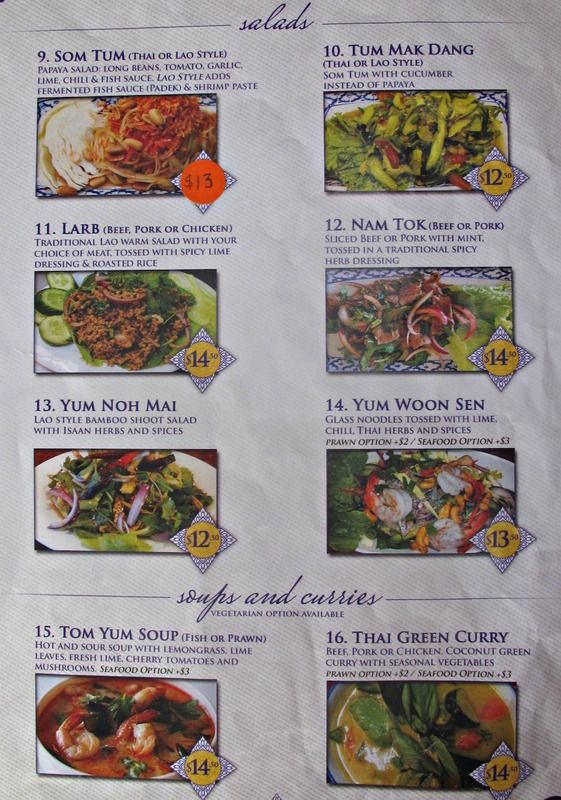 We enjoy Thai food and have written about on this site, though certainly not as often as the food of Vietnam or India. 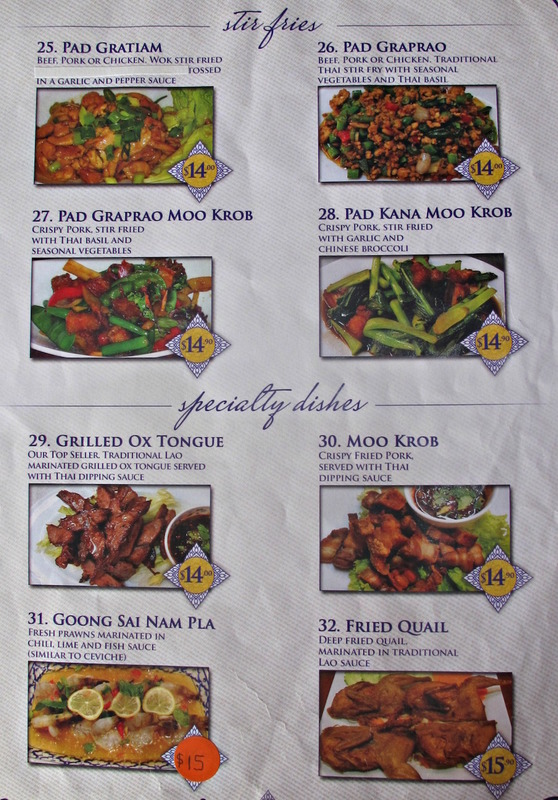 But we know Thai food is not one of the western suburbs’ strong point. 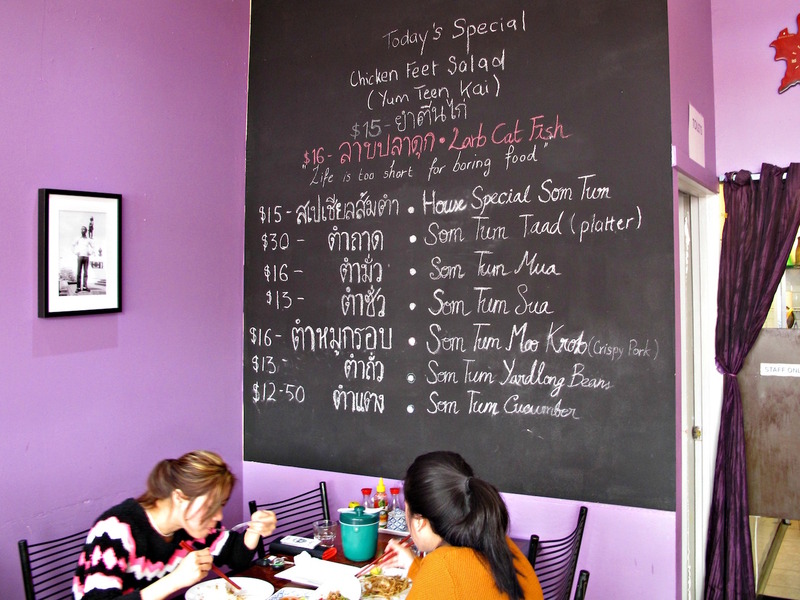 And we know there’s really, really great Thai food out there in Melbourne – because friends such as Nat and Andy of Soi 38 have been telling us so for years. 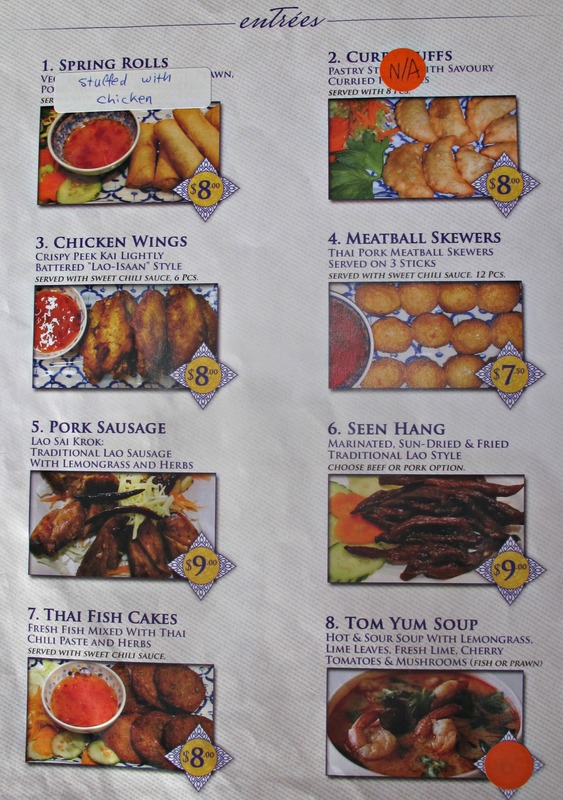 So we’ve long awaited the opportunity to get a guided tour of one of Nat’s Springvale hidey-holes, as it happens at a fine eatery that serves Thai food and also a goodly range of dishes from Laos. Do we make the most of the opportunity? Not everything we enjoy at Noi Lucky knocks our socks off but we enjoy it all one way or another. And it is certainly the most fresh, crunchy, stimulating and delicious meal we’ve ever had from a Thai and/or Lao restaurant. 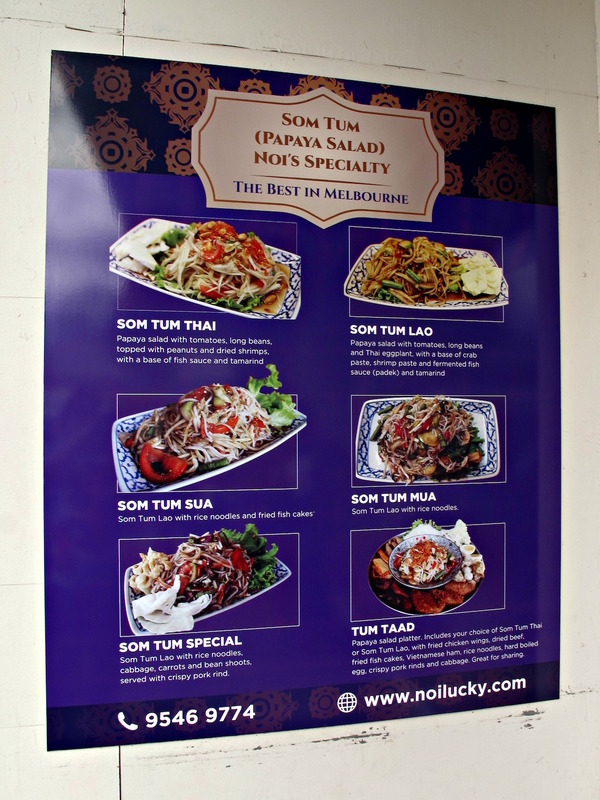 Noi Lucky is tucked away in the corner of a carpark in a corner of the Springvale commercial/food precinct. At first blush, it could be any one of hundreds of cheap Asian eateries spread across Melbourne, such is the familiarity of the vibe and everything about the place. 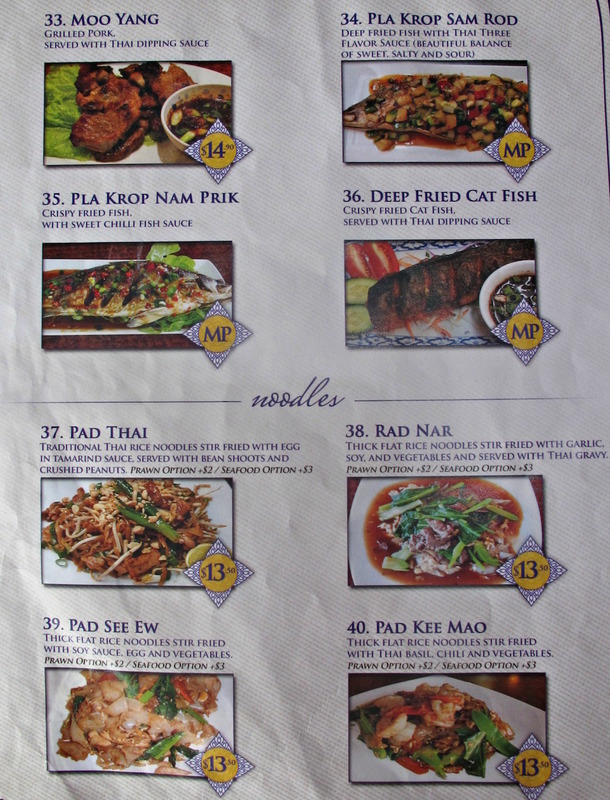 But the menu (see below) is something else – yes, there are fish cakes and curries in there. But there is very much else besides and it all looks fantastic; and very, very affordable. 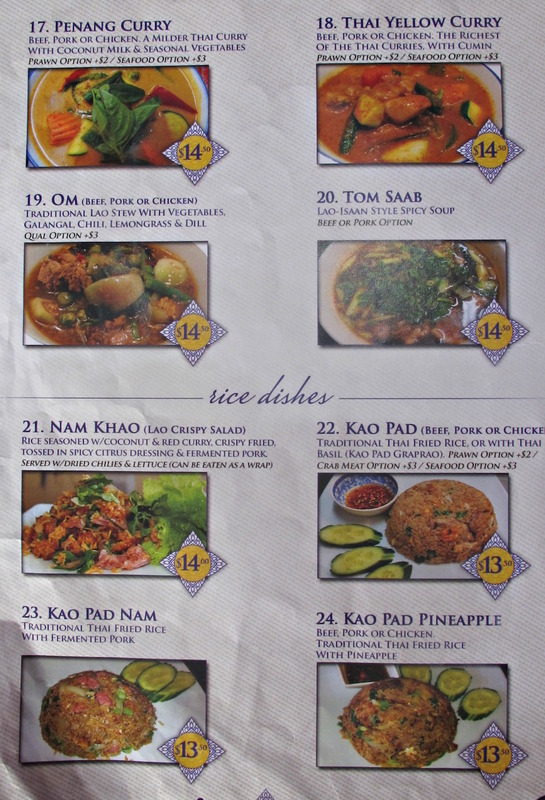 In the end, we are happy to let Nat and Jackie – regulars here – do the ordering, selecting a range of mostly Lao dishes they favour. 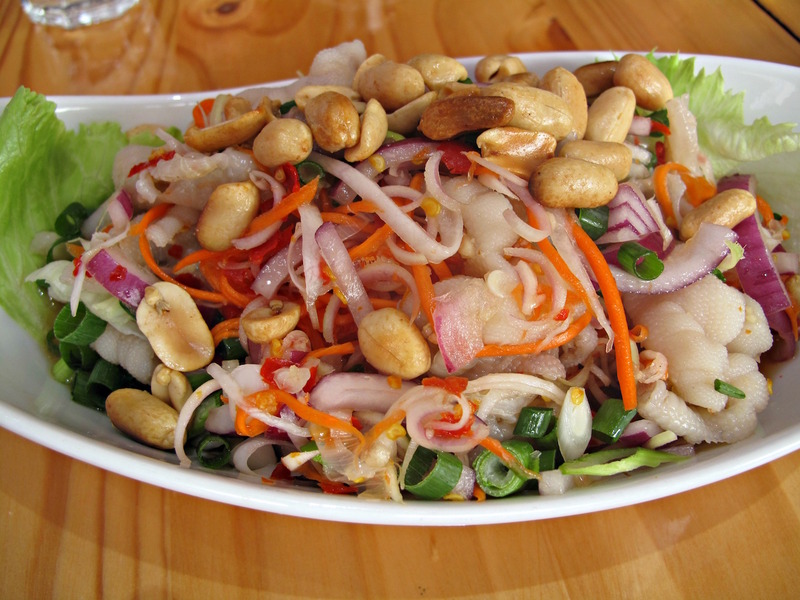 With one exception – the chicken feet salad ($15). We love us some yum cha-style, blackbean-sauce chicken feet so are dead keen on seeing what this is like. The poultry hoofers are, incredibly, boned! What’s left is pale and chewy; I’m not sure if it’s been boiled or marinated or both – not a big hit with us but OK. The rest of the salad ingredients are utterly superb – fresh-as, zingy, crunchy, perfect. They are available with a range of other protein protagonists. 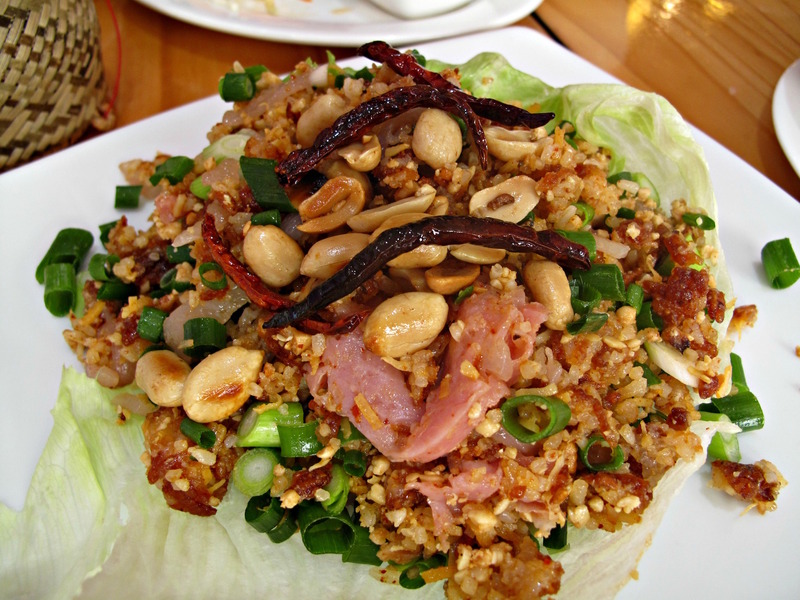 Nam khao (Lao crispy salad, $14) is rice seasoned with coconut and red curry, “crispy fried” and tossed in a spicy citrus dressing and fermented pork. This dish has a real nice nuttiness about that I suspect comes from both the coconut and the crisp-frying of the rice. 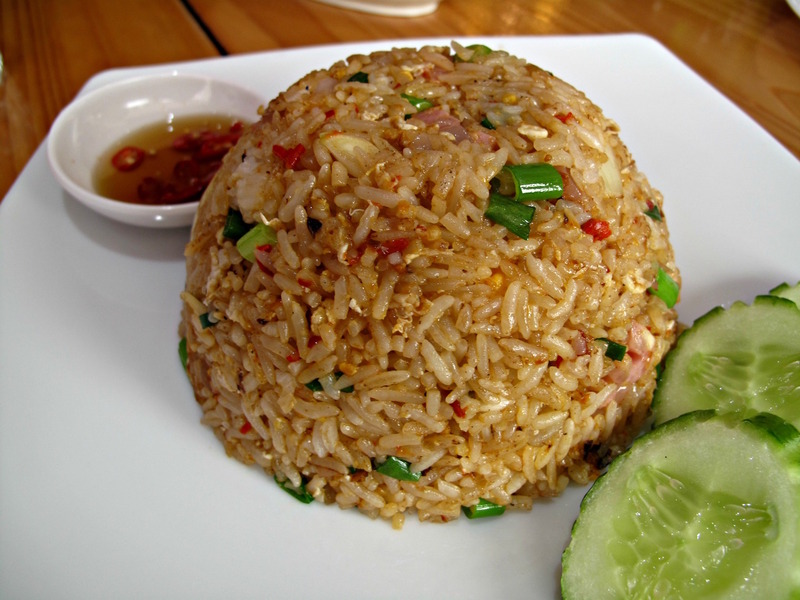 Kao pad nam (Thai fried rice with fermented pork, $13.50) is something of an ordering contrmeps but we eat it anyway. It’s a good fried rice. 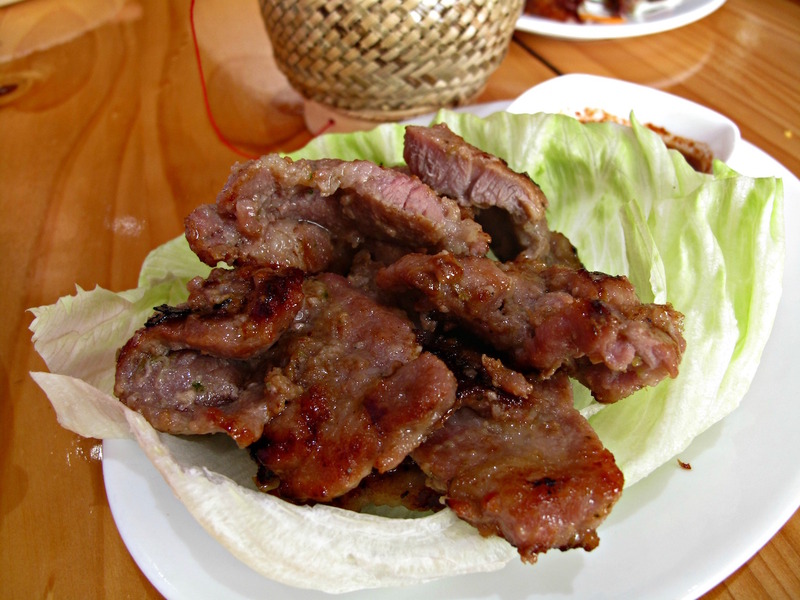 In both this case and the Lao salad, it should be noted that there is nothing at all confronting or freaky about the fermented pork – it’s just a sausage-like pork byproduct that wouldn’t be out of place, for instance, on the more familiar (to us) Vietnamese pork chop with broken rice. 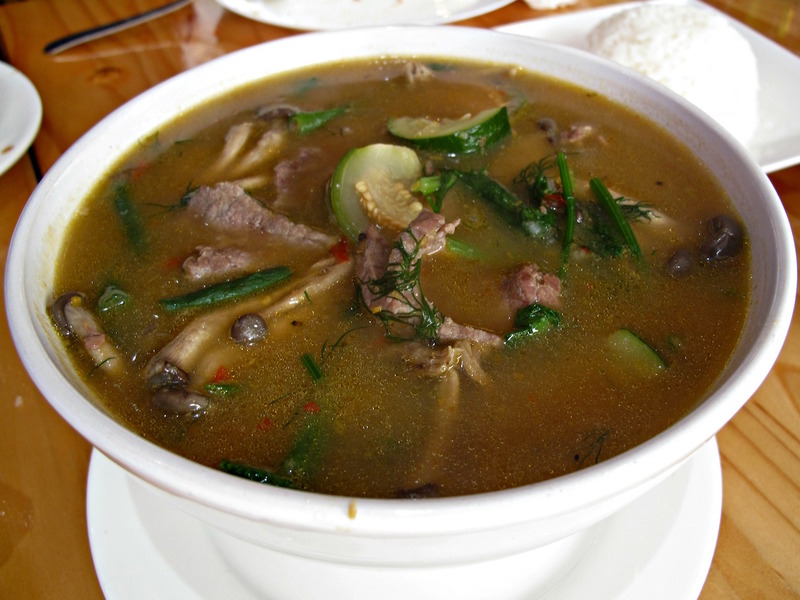 Om (top photo, $14.50) is a Lao stew of beef, with vegetables (including baby eggplants and mushrooms), galangal, chilli, lemongrass and dill. It’s not an immediate hit with me but I warm to it – and could even see myself ordering it first-choice for a solo meal here with rice. The dill flavour is very strong! 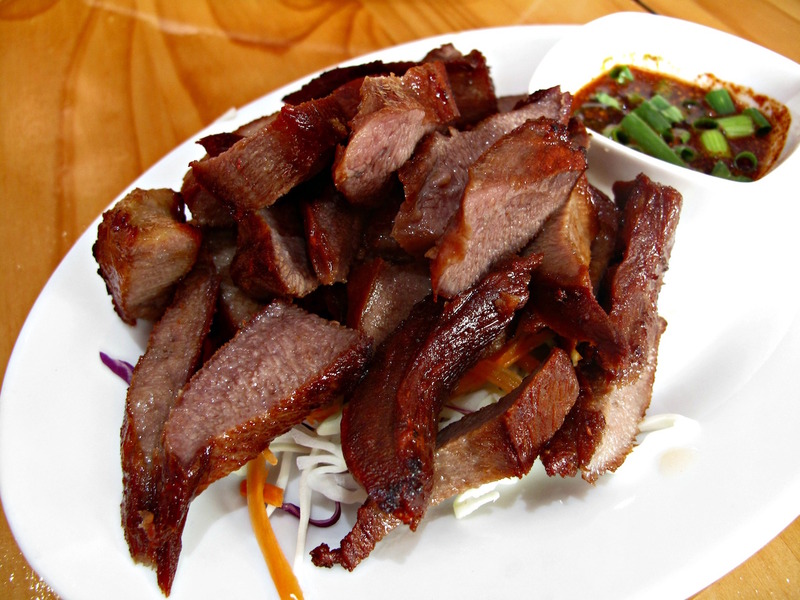 … grilled ox tongue ($14), which is – according to the menu – the joint’s most popular dish, with the marinated muscle served with a “Thai dipping sauce” that is mostly soy. This is more comprehensively cooked than I may have expected and is quite chewy. But the meat is of wonderful flavour and I can’t stop eating it. It’s true this outing to Noi Lucky has involved a bit of driving but we make up for it by dropping into Oasis Bakery on the way home for a stock-up shop! 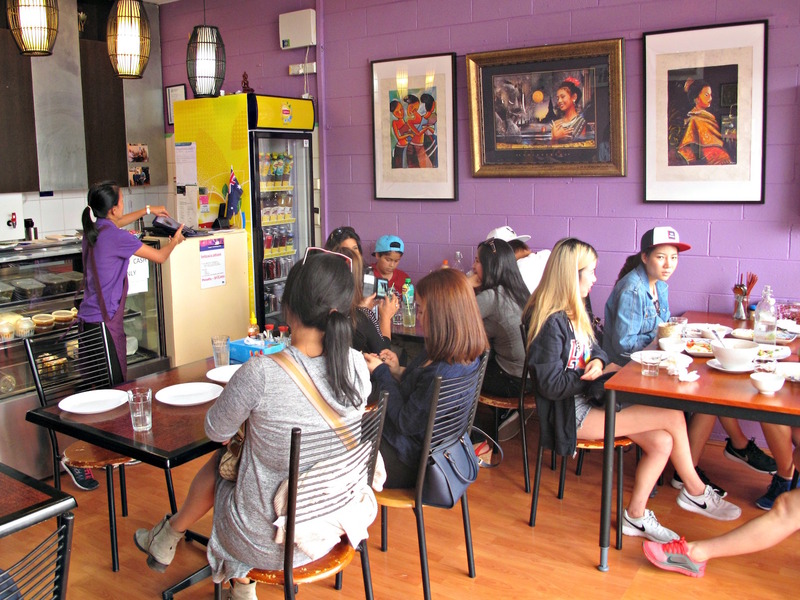 We are left with the wistful desire that the western suburbs had more Thai/Lao eateries such as the one at we’ve enjoyed for lunch – with experts guiding our way.